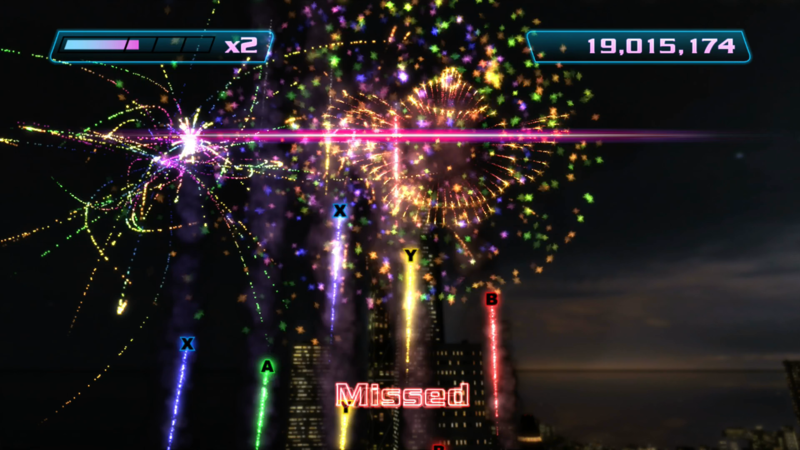 Boom Boom Rocket is a 2007 release for Xbox 360 that only came out via the Xbox Live Arcade downloadable games service. 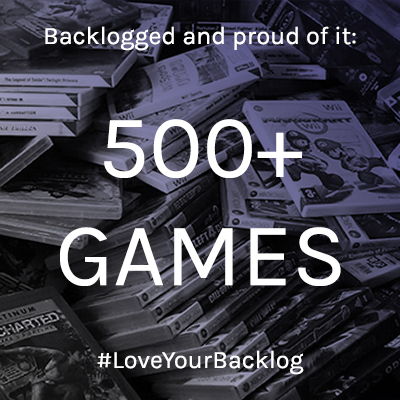 It was published by Electronic Arts’ “Pogo” brand, which is primarily known for its web-based casual games portal, and the game as a whole remains largely forgotten today. 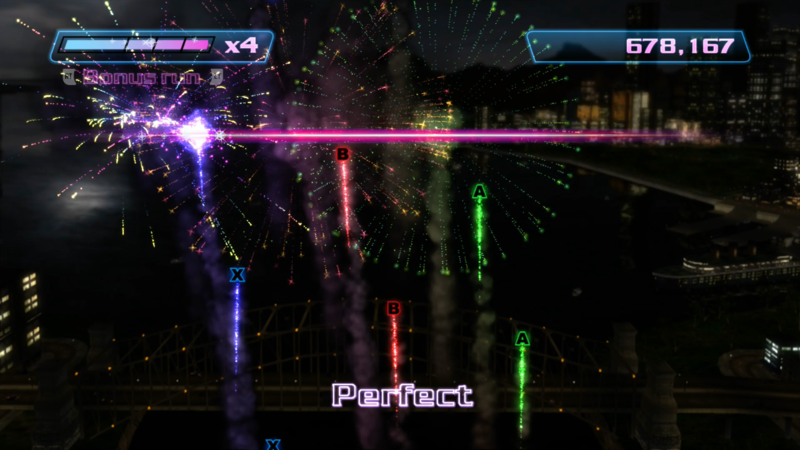 Which is a great pity, as it’s a lovely rhythm game that is very much deserving of a spot on your Xbox’s hard drive — and it’s backwards compatible with Xbox One now, too. In Boom Boom Rocket, your job is to set off fireworks in time with music — think something like your typical New Year firework displays or, if you’re as British as me, Alton Towers in November. You accomplish this by watching them float up the screen towards a purple line, then hitting the controller button indicated on them when they reach said line. You will then be graded according to your accuracy hitting the note: successful, more accurate hits are worth more points and build up a gauge in the corner of the screen, while missing notes causes the gauge to drain a little. The gauge serves two functions. Firstly, it’s a “life” gauge that indicates how well you’re doing in the song. Allow it to drain completely and you fail the song — though Boom Boom Rocket is pretty forgiving for the most part, so it’s actually quite rare this will happen. The emphasis here is on attaining and beating high scores rather than struggling to even clear a song. The second function the gauge has is as a score multiplier. When the bar on the gauge crosses a threshold into a new segment, your multiplier increases up to a maximum of 4 during normal play. When it’s completely full, your score display will begin to flash, and at this point a squeeze of either controller trigger will trigger a “Bonus Run”. 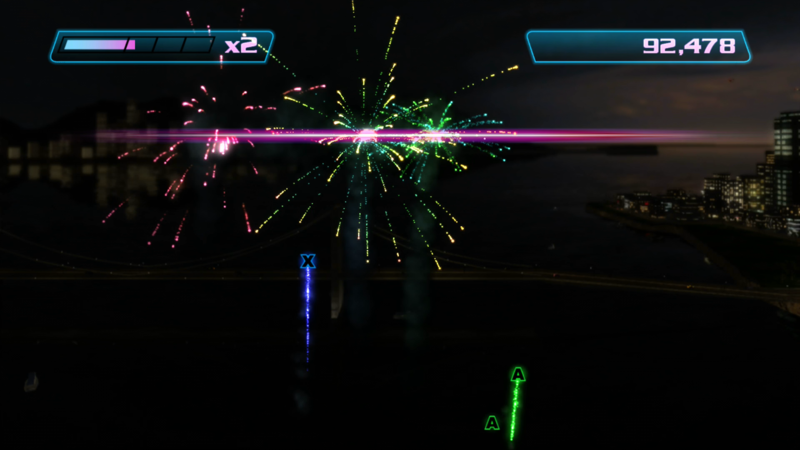 During a bonus run, the fireworks explode with more force, the background becomes distinctly psychedelic, your multiplier shoots up to 16 and you also gain an additional flat 50,000 points for each note you successfully hit. However, the gauge constantly drains during a Bonus Run and returns you to normal play once it is empty, plopping the gauge back down to towards the top end of a 2x multiplier and requiring you to build it back up again. The Bonus Run mechanic is quite interesting because timing is super-important. You don’t get points just for triggering a Bonus Run; it’s most efficient to trigger one just before a section of song that is particularly dense with notes, as the combination of the 16x multiplier and the flat 50,000 per hit adds up very quickly under optimal circumstances. Conversely, wait too long and you might have fewer opportunities to take advantage of this system during a song, so a key part of learning the various tracks on offer in Boom Boom Rocket is figuring out the optimal times to set off a Bonus Run. At the end of a track you’re given a final score and a breakdown of your accuracy, hit percentage and number of misses, all of which contribute towards a letter grade. 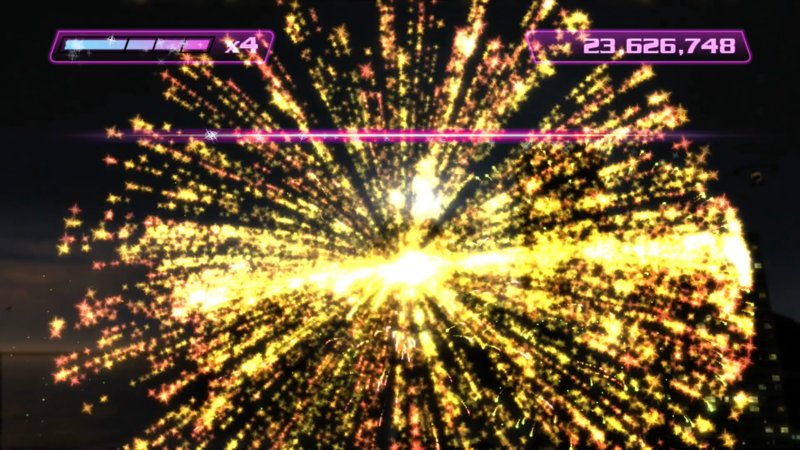 You also have the opportunity to unlock unique firework patterns — one per difficulty grade per song — which will randomly appear as part of the fireworks displays you create from thereon. Successfully achieving this involves not only clearing the song, but also hitting a special curly-tailed firework during the song. The songs are all remixes of classical themes, and looking back on this game over 10 years later, represent an interesting snapshot of what popular and electronic dance music was doing at the time. 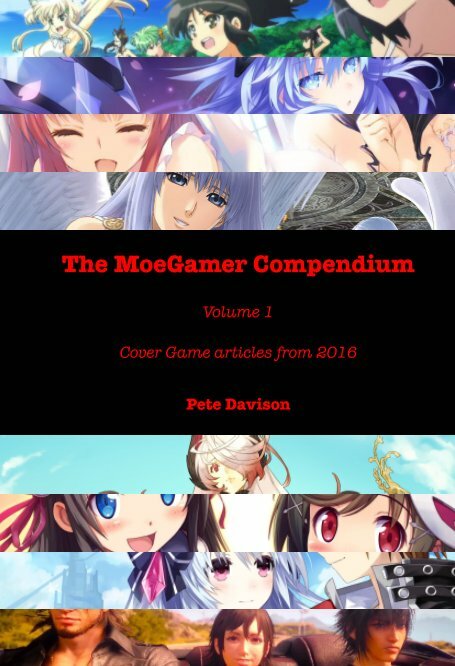 In the original 10 tracks included with the base game, we have a variety of styles represented, ranging from melodic trance (“Tail Light Sonata” is a particularly pleasant remix of Beethoven’s “Moonlight Sonata”) to thrashing big beat, breakbeat and techno. The five tracks in the DLC pack, meanwhile, emphasise guitar-heavy instrumental rock, since they coincided with an update to the game that added support for guitar controllers such as those used for EA’s Rock Band and Activision’s Guitar Hero. A guitar accessory isn’t mandatory to enjoy these tracks, mind you; they play just fine with a conventional controller. Boom Boom Rocket doesn’t have a metagame beyond unlocking the special fireworks and attempting to set high scores on all the tracks and in their Endurance mode incarnations. All music is available from the outset, meaning you can jump straight in and enjoy the game how you see fit in traditional “arcade” style. For some, this may hurt the game’s longevity, particularly considering the limited track list on offer compared to larger-scale music games out there, but for me, the game’s inherent and deliberate limitations make it ideal as a pick-up-and-play title that can be enjoyed for a few minutes when you just feel the need to chill out. 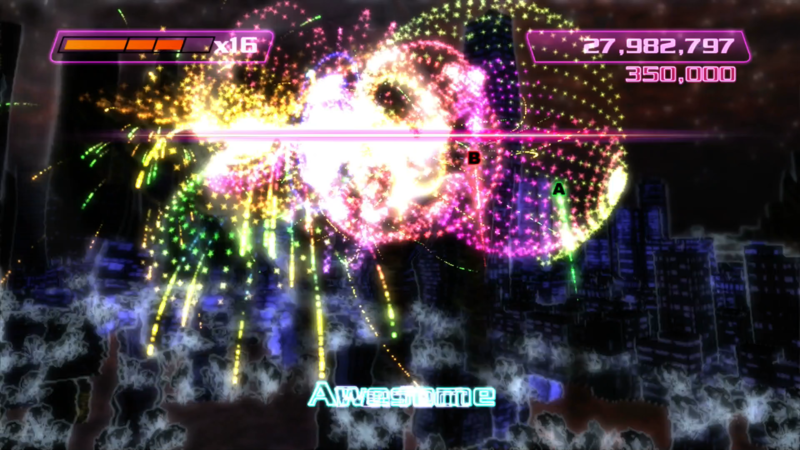 You can even make use of the Visualiser mode to display firework displays that respond to your own collection of music on the Xbox’s hard drive, and the Endurance mode provides an enjoyable, increasingly hectic challenge for skilled players who can comfortably clear stages and attain high scores without too much difficulty. You may think that as a digital-only release, Boom Boom Rocket is one of those titles at risk of being completely forgotten and practically erased from history at some indefinite point in the future. However, for those concerned about such things, note that the game was included on the Xbox Live Arcade Compilation disc that was distributed with the hard drive-free “Arcade” model Xbox 360s for a while. Acquiring one of these discs usually means going via third-party sellers today, but if you can track one down it’s a good means of acquiring more “permanent” copies of not only Boom Boom Rocket but also Feeding Frenzy, Luxor 2, Pac-Man Championship Edition and Uno as well as demo versions of Marble Blast Ultra, 3D Ultra Minigolf Adventures, Frogger, Viva Pinata, Surf’s Up, Zuma and Soltrio Solitaire. In some cases, you can also find this disc as part of a double-pack with Sega Superstars Tennis, too. However you choose to acquire it, Boom Boom Rocket is a great addition to any Xbox 360 collection, one of my favourite Bizarre Creations titles and one of many reasons I’m sad this talented outfit is no longer with us. I guess there’s only one thing for it: a firework-based salute. Rest in peace, Bizarre Creations! It’s a shame that Bizarre Creations didn’t live on as they were an integral contributor to the Xbox platform’s early years. I still play Geometry Wars! Boom Boom Rocket was an odd one here in Australia… For a long time we couldn’t get the game at all which was absurd. Yeah, I miss Bizarre Creations a great deal. Blur deserved much better than the treatment Activision gave it, and their earlier output was consistently excellent, too. I still play Geometry Wars as well — 2 remains my favourite installment!